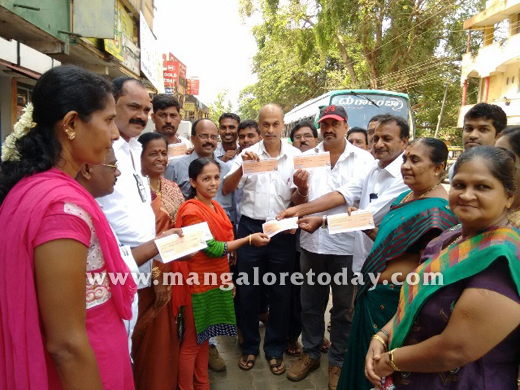 Kundapur, May 07, 2015: Malyady Shivaram Shetty, Kundapur Block Congress President has demanded an apology from the BJP for its ‘false’ promise of bringing back black money from the Swiss Bank within 100 days of the Narendra Modi government coming to power. Speaking at a mock black money cheque distribution programme organised at Kundapur on May 7, Thursday, Shetty said the BJP had fooled the people through its false promise that it would deposit Rs 15 lakh in the bank account of every Indian after bringing back the black money. “Today, when the BJP government has completed over 200 days in office at the Centre, the BJP men are silent on the issue. The BJP as promised by it should distribute the black money among people or else apologise to the nation,” he said. Jacob D’Souza, Kundapur Town Planning Authority President, Deepak Navunda, Chandrashekhar Shetty of Congress IT cell, Vinod Crasta, city unit Secretary, Shakuntala Gulvady, Jyothi Kodi, Councillors and others were present.